Atari's bringing one of its classic games back to life, and pitting players against updated ghosts and monsters in a new version of Haunted House. One of Atari's advantages is that it has a surplus of classic properties that are rich for IP mining. The publisher has dug through its dusty vaults and emerged with Haunted House, the title considered by many to be the first survival horror videogame and which was originally an Atari 2600 game released in 1981 was rereleased for Microsoft's Game Room. The new game will be released for digital download on PC and "other platforms" (XBLA and Wii versions have been announced, though a PSN version hasn't been revealed) in September. No price point has been announced yet, either. According to Atari, Haunted House's premise isn't all that different from what it was 29 years ago, as you dodge bats, spiders, and ghosts while searching for a magical urn in the titular building. 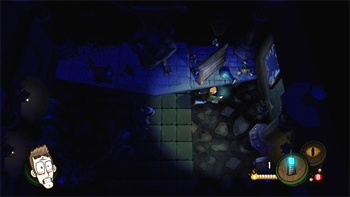 The remake is going to keep the perspective of the original, though some new gameplay elements will be included, too, like hidden treasures, various puzzles, boss fights, and a final showdown with Zachary Graves. Overall, it sounds like a spooky-yet-kid-friendly little title. The game's website is live, but the only option available right now is to sign up for further information.